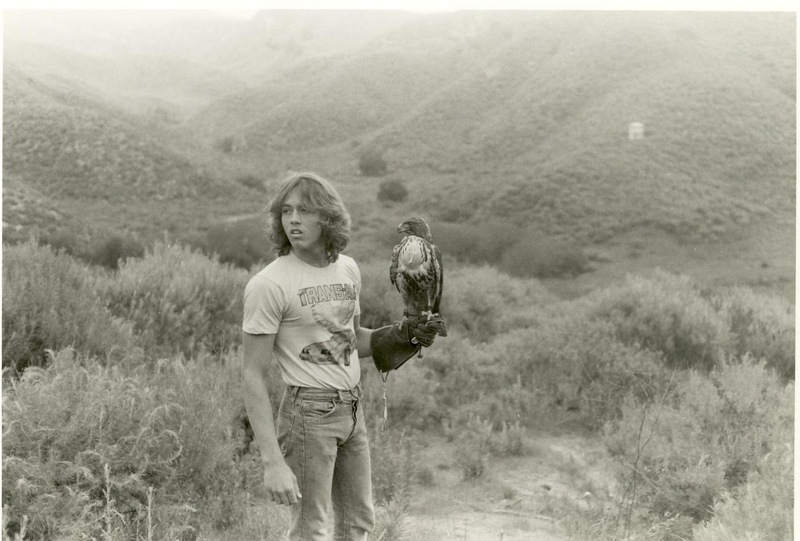 Joe Roy, III began training hawks when he was 9 years old. Birds of prey turned into a lifelong passion: Roy writes about them, teaches others about them, works with them and even lives with them. But his favorite thing to do is to go hunting with them. "It makes my heart pound, and time somehow seems to slow down, even as the falcon stoops at lightning-like speed," says Roy. 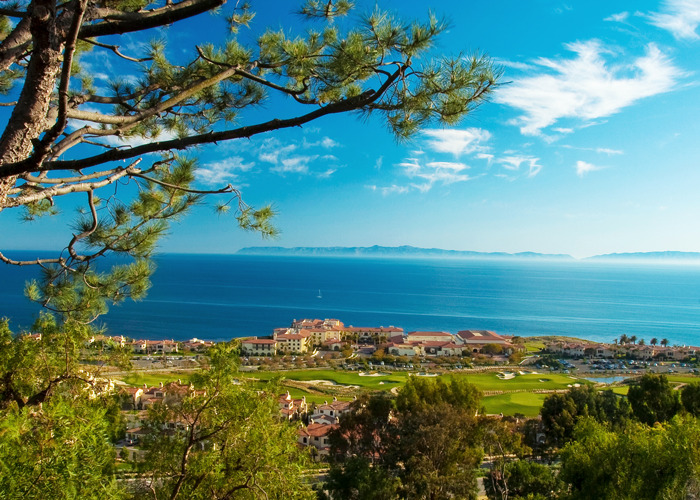 For the last couple of years, Roy has been working as a bird control specialist at Terranea Resort, in Palos Verdes, California. The beachfront property uses trained falcons and other birds of prey to scare away seagulls, crows, pigeons and other pesky birds from the airspace around the resort. Roy also gives performances and talks, allowing guests to get up close with the birds and learn how they are launched and fed, and how they play an important role in the environment. While Roy says he’s happy he can earn a living by working with raptors, he’s quick to note that money has never been the driving force behind his daily interactions with the birds. 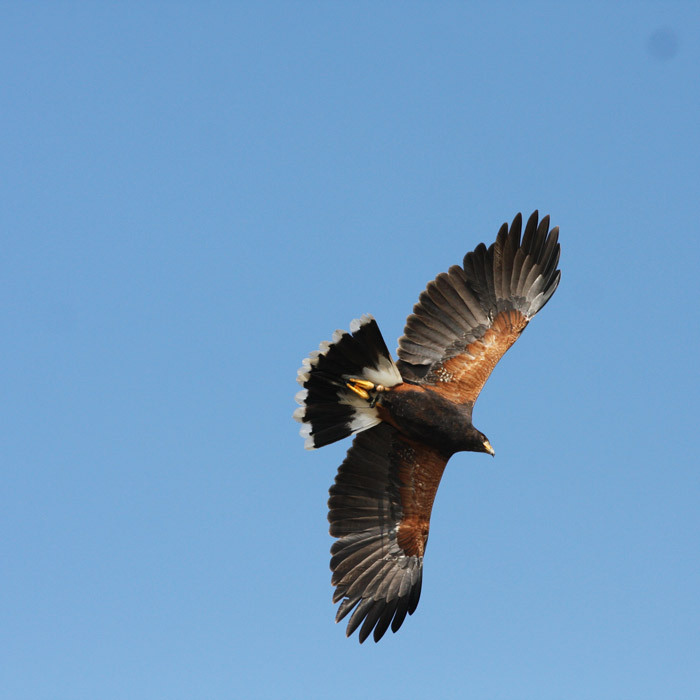 "Birds of prey make my life richer in ways that money can’t buy," he says. My days begin early. Skipping breakfast, I drink a cup of coffee, or juice and get the bird handling underway. 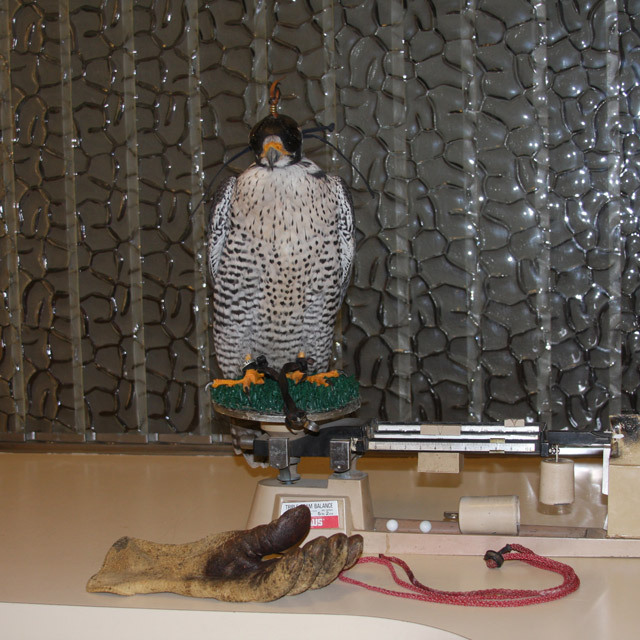 Hawks and falcons are weighed on a gram scale every morning before either being loaded in the truck. Or, for those staying home, blocked out (perched) in the weathering yard with pans of fresh water for drinking and bathing. The birds are weighed to accurately manage caloric intake. Much of a falcon’s training is food-based. I’m aiming for peak athleticism, while at the same time generating an appetite each morning in order to stimulate predatory drive and recall. Though I only live 40 miles from the resort, the commute in will take an hour. By the time I arrive on site, the sun will have already risen and there is work to be done. To get started, I collect my designated golf-cart (stenciled, “Falconer”) and get it ready to roll: an old blanket is spread on the cart’s bed to catch falcon mutes (droppings) and a canopy is pulled over the top to provide shade and protection to birds riding therein. I also load a hawking bag, binoculars, radio-telemetry, cooler with hawk food, Gatorade or water, cell phone, and of course, sun block. Finally Omen, my reliable old gyr x peregrine hybrid, is loaded and off we go. Omen is my most experienced falcon, 18 this year I believe. I’ve had Omen since he was a fuzzy downy and hand raised him in the house. Cart fully loaded, Omen and I make our first pass around the sprawling complex. Even at this early hour, crows and ravens may have already infiltrated the facility, hoping to score some food. I try to beat them to these first-light feasts, and so keep a box of disposable latex gloves in a compartment under the seat of my cart. Yes, it’s true: as glamorous as my job may appear; I am a self-appointed trash-picker-upper. This morning, the property is all clear, but if I bump into any interlopers on our first pass, I’ll cut Omen loose. Omen, it turns out, doesn’t like ravens or crows… especially ravens. One of my favorite mentors is a deceased falconer named Ronald Stevens. Stevens experimented with liberating his falcons on the grounds of his country estate. His falcons could do as they please throughout the day, though they flew into a mews (hawk-house) to sleep at night. 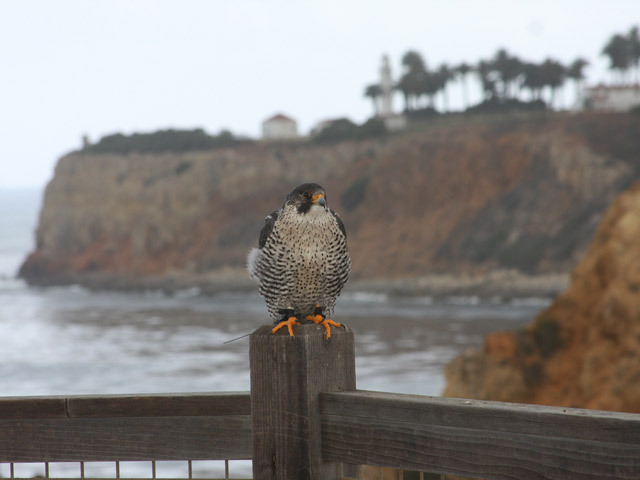 I find the concept of liberating trained falcons very appealing, but never felt as though I had the right set of circumstances: Then came Terranea. I release Omen early in the morning, and pick him up anywhere from one to three hours later. He is affixed with a radio transmitter, and I check up on him periodically. But for all practical purposes, he is free to go where he chooses, and do what he wants. If the ravens happen to come in, they are in for unpleasant surprise. While Omen does his thing, I continue to course the facility in my cart, watching for birds, and eliminating temptation by removing additional food sources. 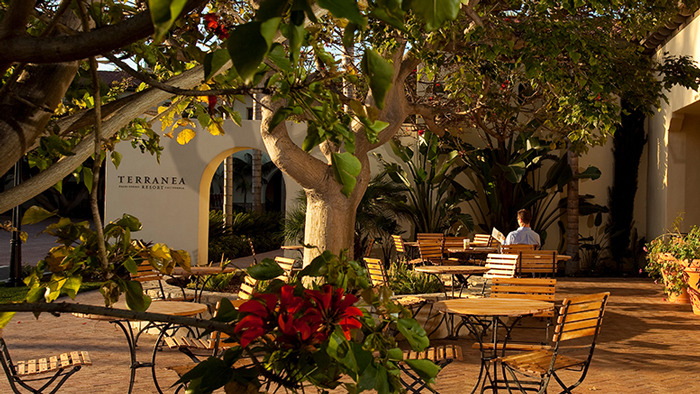 Sometimes I drop by Sea Beans, Terranea’s coffee shop, and snag something delicious for a quick, in-the-cart, kind of breakfast. Eventually, Omen will get hungry too, and want to come in for breakfast. 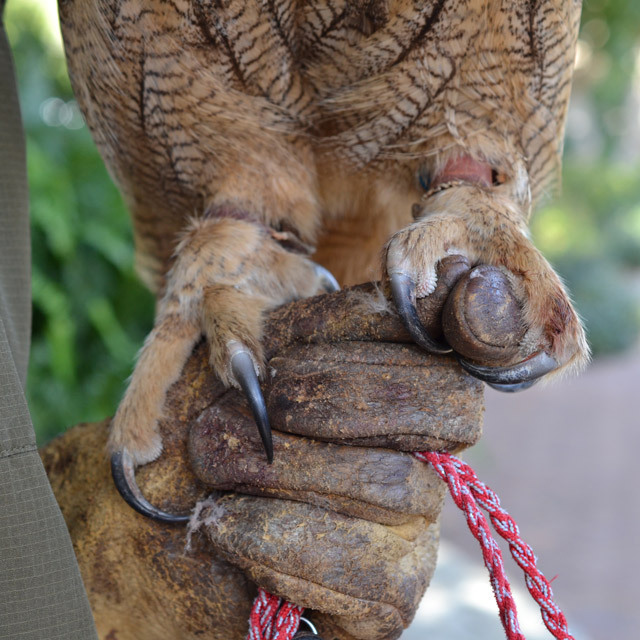 Omen eats commercially grown exotic quail. UPS routinely brings me a box of 250 frozen quail, which I thaw as needed. Omen demonstrates his desire to eat by flying down and landing on the top of my cart when I stop nearby. 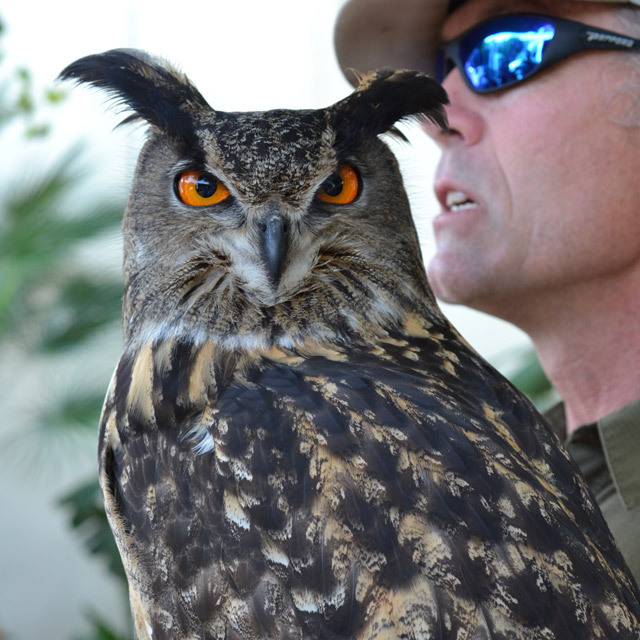 It’s time for my daily “meet and greet”, wherein guests of the resort, as well as members of the surrounding community can come say hi and see the birds, including “Owlbert”, a Eurasian eagle owl whose large face and orange eyes beg to be photographed. By the time I wrap up the meet and greet it is lunchtime where I eat in the employee dining area. Omen, done for the day, is switched out for one of my favorite hawks, “Alaka.” Alaka is a Harris’s hawk, and she is big and she is powerful and she knows it. Alaka doesn’t have the speed to simply go out and catch seagulls at will. However, that does not prevent her from chasing them off tables and such. I like to think of her as the sheriff, the enforcer, and the one who helps convince seagulls that forsaking the ocean and coming to Terranea to feed is dangerous. Alaka is not autonomous like Omen. She is flown in a more controlled fashion in direct response to nuisance birds and is “A to B,” flying from my hand to the top of a building, etc. and then back to my hand. However, the most fun we have together is when the onshore wind is blowing hard, hitting the cliff at the ocean’s edge, creating tremendous vertical lift. When Alaka hits that amplified wall of air, it shoots her straight up, and it’s as if she’s riding some kind of crazy roller coaster. I give my first of two presentations to consultants. We meet in the seventh floor boardroom and discuss everything from falconry and bird control to predation and ecology. 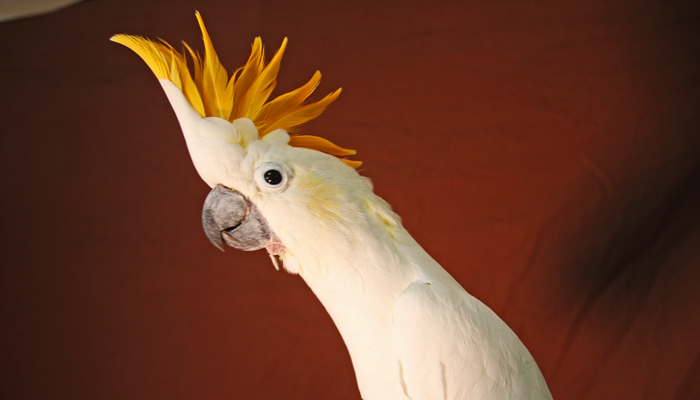 I show them Alaka, as well as my citron cockatoo and African grey parrots. 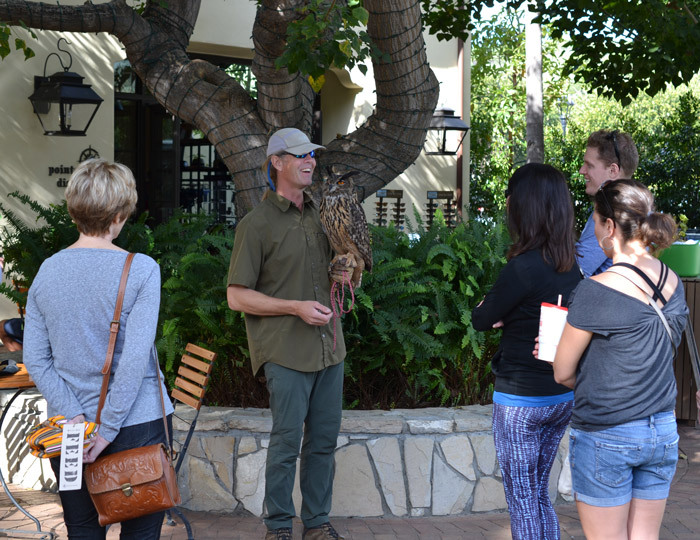 Aside from my bird control activities, the resort utilizes my bird training and teaching skills to present "Falconry Experiences" to individual parties and groups. I am able to craft an experience that is raptor based, but has a strong environmental component as well. I want to make a difference, but I also want people to have a good time. I usually wrap my days up in the early afternoon, thus missing the worst of the traffic on the way home. But not today. All of the birds are loaded in my truck. Hawks and falcons are hooded to eliminate any stress or anxiety during transport. Owlbert and the parrots travel in modified dog kennels. 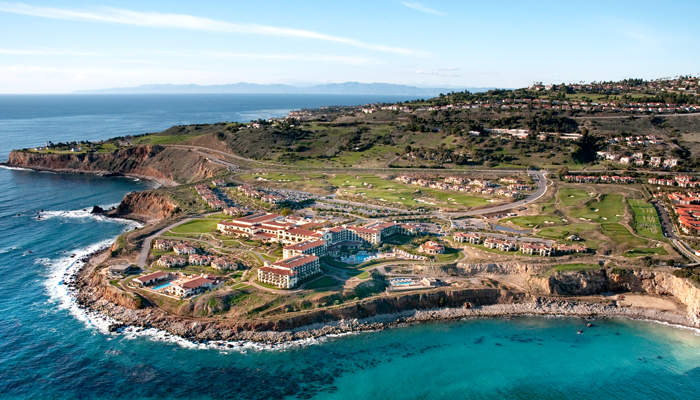 In my view, coming to Terranea, whether to work, play or just relax, and not taking at least a moment to connect to the environment, the lush, native vegetation, and diverse wildlife, is a missed opportunity. I try to miss out as infrequently as possible. I am outdoors all day long and that’s the way I like it. It is one of the perks of my job, along with meeting people from all walks of life, both local, national and international. On my usual schedule, I like to be in bed by 7:30 p.m. for my 4:30 a.m. alarm to get the proper amount of “beauty rest” so I’m not dragging the next day. Getting home later today, I throw some leftovers in the microwave and watch TV. Public speaking during the day gets me wired, so it takes some time to relax enough to sleep. By the time I arrive home, all of the birds -- 3 falcons, 2 hawks, 2 parrots and 1 pigeon -- will have been fed, except Owlbert. He likes to eat after dark. 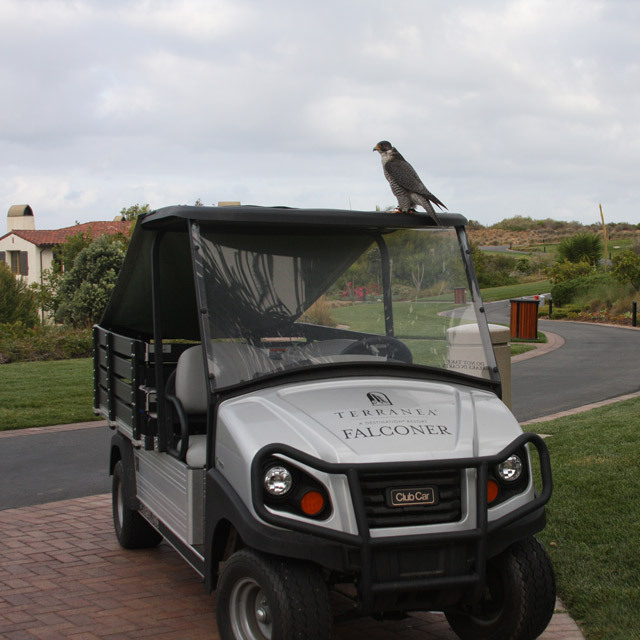 If, one day, you happen to come to Terranea and see me drive by in my falcon-mobile, say hello, and I will tell you what I know about birds.